Saturday afternoon at the library. Promoter Jim Greenwood supplies this poster. Believe it's from 1968/9. Looks cycledelic! According to Jim the rider pictured is Darryl Dent of White Rock. Second to last race of the Inter-City series at Grandview Bowl, Nanaimo, BC. The Tony Slogar Memorial was in honour of Tony Slogar, who lost his life in a CAMRA racing accident at Eugene, OR, in 1964. Haven't found anything so far for 1928, so skip ahead to 1929. A race scheduled, given promotional space in both the Sun and Province, but no results. Rain? Probably, but it would be nice to have had some sort of confirmation of the cancellation in one of those newspapers. Add a motorcycle hill climb to the body of knowledge. And note the passing of promoter Con Jones in June of 1929. Jones' name came up in 1912 when he helped promote a race at Minoru Park for the Victoria Order of Nurses. And Salt Lake City resident and promoter Ab Jenkins raced into town to promote the Studebaker President Eight automobile. 115 hp, 80 mph at only $2995. Available at Willis Kingsley Motors Ltd., Georgia at Bute. The race story in this SCCBC Pit Pass is too hipster for me to decipher. They went far too "man" in what I'm guessing to be beatnik-speak. But the photos are cool, uh, daddy-O. The Van-Man-Van (Vancouver to Manning Park and back to Vancouver, on back roads, etc.) was a pretty famous rally in its time. I'm not sure how many years it ran but it was a major race in the calender of the Sports Car Club of BC. Clipping comes from the Ubyssey UBC students' newspaper of 1958. King of the Speedway by Zip Saunders. A 1939 little big book. Here's a clipping from the Surrey Leader about the second race of the 1967 season at Cloverdale. Short flat track racing, indoors. Promoter was Jim Greenwood, who's still around, not so much promoting stuff but he did organize the BCHRA 50th anniversary a couple years ago, is president of the Greater Vancouver Motorsport Pioneers Society for 2009 and still has a steady hand for pin-striping. A third race during the month of August, 1966, at Grandview Bowl. I owe a great debt of gratitude to newspapers like the Nanaimo Free Press for covering the racing as well as they did. 1927, and all I can find is a rain-out in May and a two day series during the Exhibition, the second day ending with the fatal accident of Seattle's Phil Churchill. Gary Jackson, from Vancouver, at Daytona, 1967? The second clipping. According to the Vancouver Sun Gary qualified for the 500. His speed is off of the pole sitter, Curtis Turner, but, again, no record of Gary in the race. The only thing that I would like to see is some sort of qualifying sheets for the race. That might sort out if his name shows up at all. Oh, and by the way, Mario Andretti won the big race in 1967. 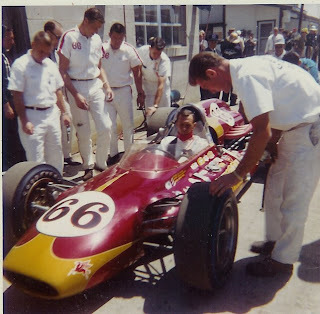 Gary Jackson, from Vancouver, at Daytona, 1967? Here's a weird one. First of two news items referencing a Gary Jackson, from Vancouver, BC, going to the 1967 Daytona 500. Can't seem to find anything about him, though, in all the official records on the 500 of that year, including the qualifying races, the ARCA race and the modified race. A mystery. Anyone know more about this? Here's some links to the 1967 Daytona races. The first 100 mile qualifier, the second 100 mile qualifier, and the Daytona 500. A new series of comics starting this Sunday. This is definitely a weird one that I stumbled across while looking for something else. Tillie the Toiler came out of the 1920s and is one of those almost forgotten strips these days. Mac has something hidden in his garage. And hilarity and frivolity ensue. Or so we hope. And will find out. Five strips to kick this off. Every couple weeks during the summer of 1966 the modifieds of VITRA, MIARA and the BCTRA gathered in Nanaimo. Having the Vancouver based drivers seemed to be a novelty for the Nanaimo crowd as is indicated by the most popular driver voting having the Vancouver drivers in the top 12. A Victoria auto race, no doubt to feature the talents of Jack "Lucky" Smith, transplanted from Alberta, who would become the "daddy of Victoria racing" in the 1930s and 1940s. He wasn't the only one but he was one of the more important founders of the racing tradition Victoria has gained a reputation for. It's been pointed out to me that in this posting on the Knox Mountain Hill climb I called Ian Wood's car a "Porsche" when it really is a Rawlson. An advertisement in the Victoria Daily Colonist from 1915. And the only reason I was looking there was that I'd come across information that there were motorcycle races to be held on May 22 and 24, 1915 at The Willows. And, by golly, there were races held. More on that in future early Vancouver postings. A "shop-soiled" Henderson, eh? Down to $250 from $410. I doubt I could of afforded it then, but now, yeah, I'd take it at $250. I remember silly t.v. ads featuring Basil Plimley when there was a dealership in Vancouver as well. Must have been the son. Another A and B modified event at Grandview Bowl during the summer of 1966. While Ray Pottinger of Nanaimo won the feature (and his wife, Vi, the powder puff trophy dash) Al Smith of Victoria set a new track record. 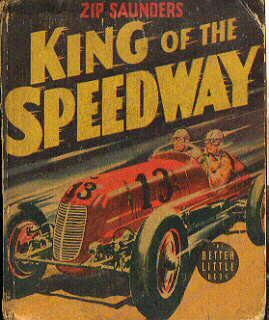 Another holiday in 1926 and another visit by what I like to think of as the "dirt track kings of California". Other northwest drivers like Jack Ross, Gus Duray and Victoria's Jack Smith were also here. And motorcycles featuring Fred Deeley, Jr.
so did Jack make it to Edmonton? And I should add a link to the H.A.M.B. forum here and up over at the links column. Mostly hot rods, and that ain't a bad thing. A review of Vollstedt: From Track Roadsters to Indy Cars, the Rolla Vollstedt Story.